One particularly enlivening visit was from a dozen students from the Sri Mayapur International School. A group of teenage girls visited the library and stayed overnight in the guest house. –Gaurangi dasi, aged 15 yrs. Note: Gaurangi was so inspired that when she returned home she threw out all her mundane literatures and had her mother buy a full set of Srimad Bhagavatam. We were very pleased to welcome Sripad BS Sannyasi Maharaja, the General Secretary of the Gaudiya Mission at Bhag Bazaar, Kolkata. 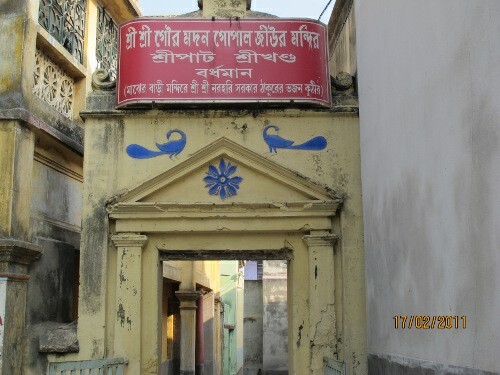 The Bhag Bazaar Gaudiya Matha is of course the first major temple constructed by the Gaudiya Matha under Srila Bhaktisiddhanta Sarasvati Thakura. Sannyasi Maharaja had a tour of the library and reciprocated by inviting BRC staff to visit the temple at Bhag Bazaar on December 28 2011. 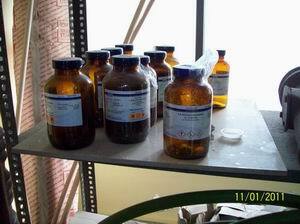 Fumigation of all inventory is essential. 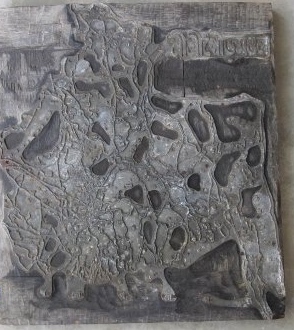 The older materials are riddled with destructive insects of various kinds and some of the oldest works are seriously eaten away. Our fumigation program is simple but effective. Acting on advice from the Asiatic Society library we obtained the necessary chemicals to ensure that all the destructive bugs were eliminated. 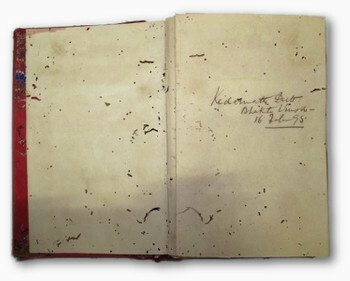 The books are enclosed in special steel almiras which allow the fumes from the chemical cocktail to circulate. Three weeks is the standard fumigation period. Once on the shelves of the library the books are surrounded by naphalene balls to keep out any possible new infestations. 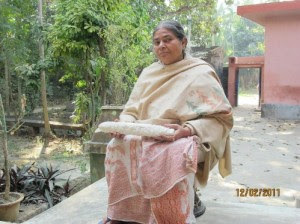 During the second half of 2011, The BRC Manuscripts Mission traveled to libraries in West Bengal. The Most significant of the hundreds of works we have photographed in the last six months is a tal manuscript worshiped on the altar at Caitanya Tal Mandir in Navadwipa. 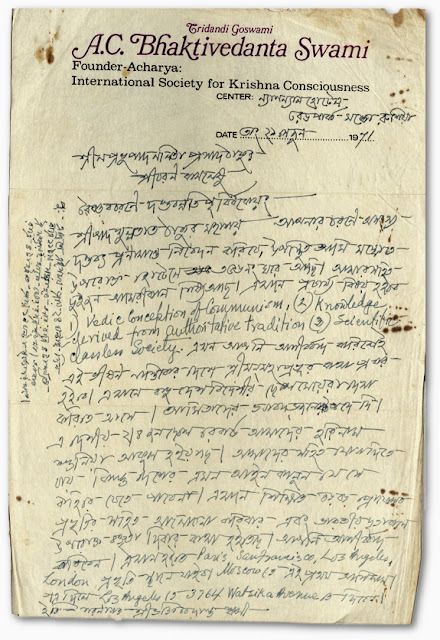 This manuscript is said to be a commentary by Srila Gadadhara Pandit on the 10th Canto of Srimad Bhagavatam, with annotations by Sri Caitanya Mahaprabhu Himself! While this will need to be verified, we are very grateful to head mahanta Sri Sudin Goswami (at right with the manuscript) who was extremely cooperative and friendly and allowed us to photograph the entire manuscript. In exchange we supplied him a disc with the digital images and we will make a complete copy on metal plates for the temple to preserve the work for many generations to come. Another library successfully reproduced was at the Caitanya Mandir, Gaighat, Patna. HH Mahavisnu Swami kindly gave us an introduction and in November our team spent a week photographing more than a dozen manuscripts. The temple is a little run down and requires some renovations but the Mahanta there, Sri Kishori Raman Goswami was very kind and helpful. 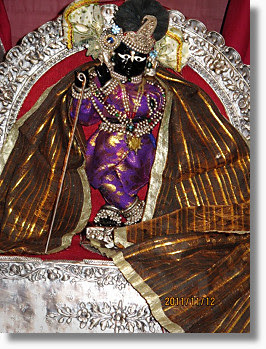 On the altar there is a beautiful Deity of Krsna Who appears very similar to Sri Sri Radha Raman in Vrndavana. 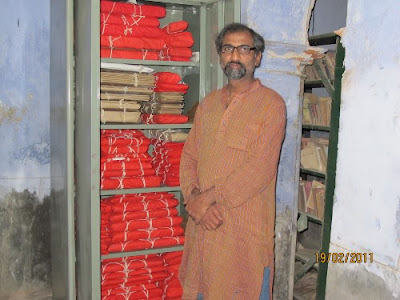 Our team carefully wrapped the manuscripts and stored them in three almiras the government has given the temple as a grant. But we were also concerned to hear that some persons have already started to sell off some of the manuscripts in the local markets for pocket money. We have made an offer to look after the manuscripts should the situation change and he can no longer care for them. This was part of a batch of 20 that were found floating around in the big Mayapur flood of 2000 and were rescued by a local man. Most were ruined but a few survived and we recorded them for posterity. 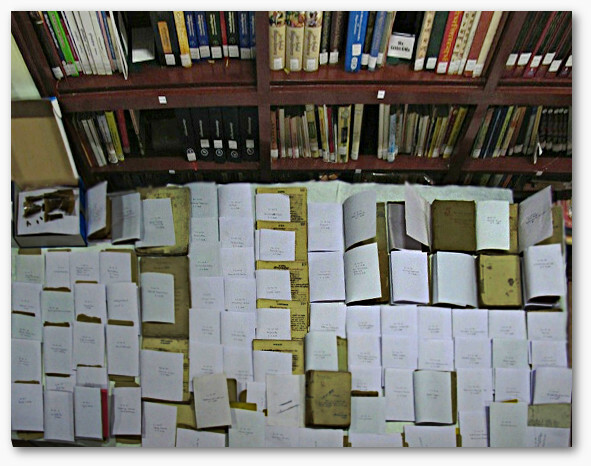 The total number of manuscripts from the Birnagar Collection is 137, plus 17 letters and 27 books. 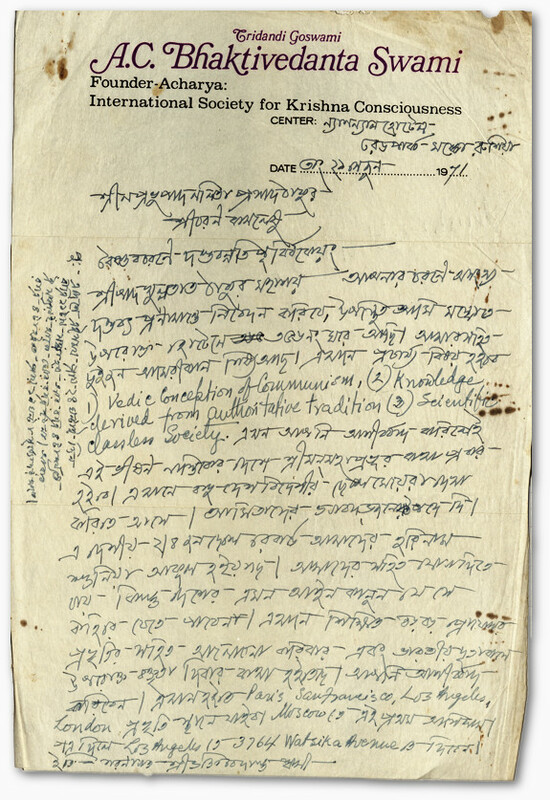 Nine are original, hand written works by Srila Bhaktivinoda Thakura, including his autobiography Svalikhita Jivani (see photos below). Kindly accept my humble obeisance to your lotus feet. At present I am staying at the above mentioned hotel in Moscow, Room No. 356. With me there are two American disciples. Here the preaching subject will be 1. Vedic Conception of Communism, 2. Knowledge derived from authoritative tradition, 3. Scientific classless society. Now with your blessing in this severely atheistic country the teachings of Sriman Mahaprabhu will be preached. Here many local and foreigner girls and boys have visited. I advise them to do the Bhajana of the Lord. A few boys of this place have become very much impressed after listening to our Harinama. They want to join us. But the laws of this country are so tough that they cannot go against them. Here discussions are going on to meet many reputable professors and there will be the arrangement of lecture in the Indian Embassy. You bless me. From here I will go to Paris, San Francisco, Los Angeles, London etc. This is the first time I came to Moscow. If you want to write to me, send it to this address—3764 Watseka Avenue. Of the remainder, there are 44 works written, edited or compiled by Lalita Prasada Thakura, as well as 33 hand copied manuscripts by Rupa and Jiva Goswamis and Visvanatha Chakravarti. 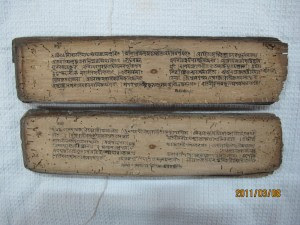 Two books are by Sri Bipin Behari Goswami, the diksa guru of Bhaktivinoda Thakura. With scanning now completed we face a great challenge in preserving them by de-acidification and encapsulation. 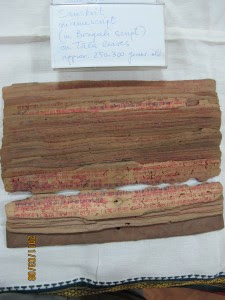 Some unknown person previously tried to laminate an unpublished work Rasa-rasodaya by Bhaktivinoda Thakura with plastic with near disastrous results. The wrong type of plastic was used and its shrinkage has damaged the manuscript considerably. Once the preservation is completed the originals will be returned to Birnagar for storage and display. Most of the scanned works will be available on the BRC website. 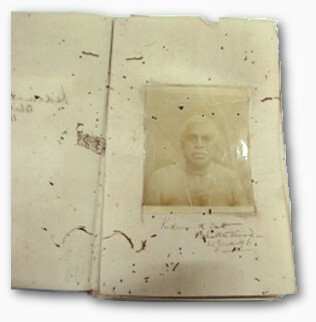 hand-written biography of Srila Bhaktivinoda Thakura. As word spreads about our catalogue and facilities for scholars and students, we are beginning to receive a growing number of guests eager to take advantage of the BRC for their studies. In the summer of 2011, we hosted several scholars doing research for their Ph.D. thesis. Although the BRC is an ISKCON project, it is open to any scholar, student or Vaisnava from any organization who wishes to take advantage of our facilities for their studies. Our research team consists of Smt. Bharati Roy and her assistant Ashish. 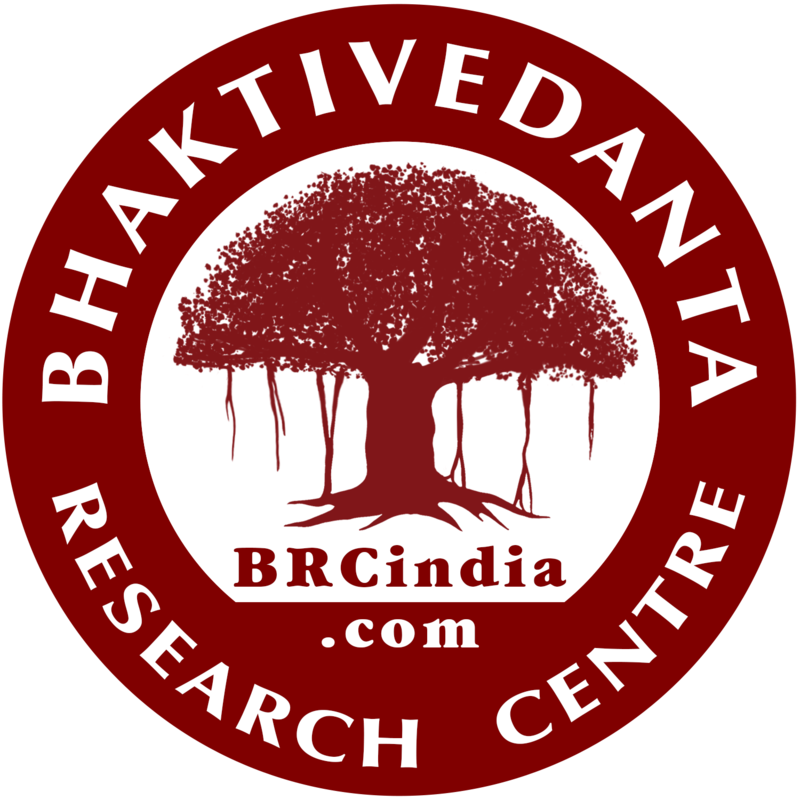 Bharati began working with ISKCON scholars in the early 1980s, doing extensive research for the Institute for Vaisnava Studies (IVS) headed by Garuda dasa (Dr. Graham Schweig) in Bengal and Jaipur, and also translation work for various individual scholars. She has worked for the last year as the BRC librarian but field research is where her heart is. As she told us at the inception of the manuscript program, "I am boiling with enthusiasm!" They began their work in their home town of Halisahar, which happens to be the birthplace of Srila Isvara Puri, the spiritual master of Lord Caitanya. 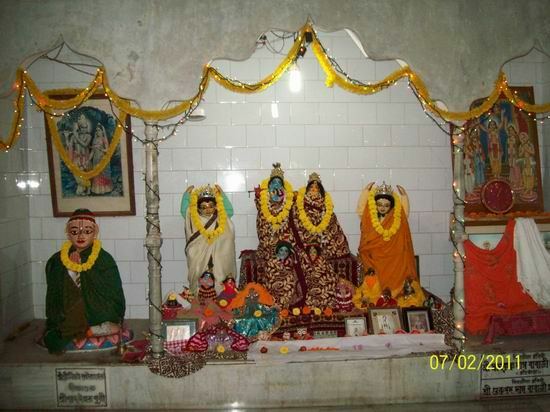 The temple of Caitanya Doba is said to be the actual site of his appearance. From there, in 17 days they visited another ten places and photographed almost 112 manuscripts, shooting nearly 7,000 images. They visited libraries, sripats, mathas and private owners. As well as photographing the manuscripts they also filled out an information sheet on each place recording Deities, custodians, number of mss, and other relevant information for the use of students and scholars in the future. This is Smt. Manasi Raya, widow of late Ashimananda Raya of Krishnanagara and descendent of the royal family there. 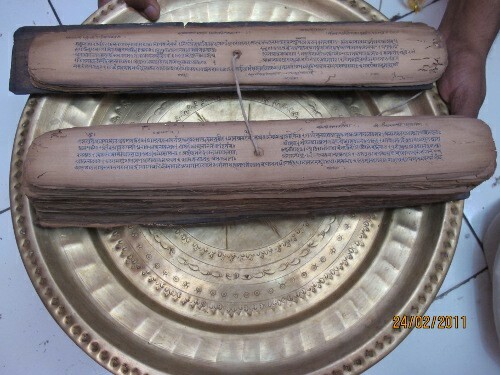 She is holding a palm leaf tal mss of the Markandeya Purana. 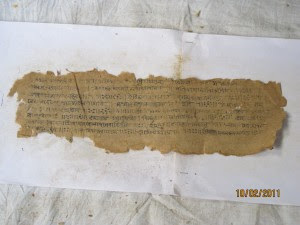 This is the only mss remaining from a large collection, since her predecessors thought their old collections to be useless and thus threw them in the Ganga. This one was preserved as a family heirloom. Such occurrences are becoming increasingly common and that’s why we are acting now as Srila Prabhupada said before it is too late. Manasi mataji also had a very old printed Srimad Bhagavatam with some nice illustrations in it which we estimate to be at least 150 yrs. old. You can see the damage caused by insects on the left cover. 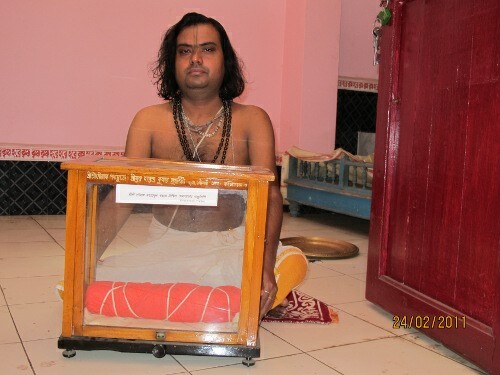 On the altar is a wood and glass box containing a mss that is said to be the original Caitanya Bhagavat by Srila Vrndavana dasa Thakura. 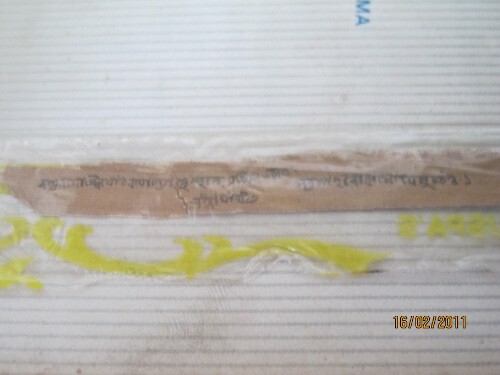 We were allowed to photograph these from the outside of the box because, following an attempt to steal it by a young man disguised as a Hindu sadhu, the box was sealed and even the current pujari can’t open it. 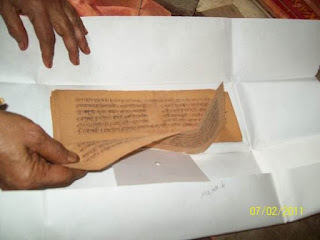 They were created and used by Haridasa Dasa, the scholar who discovered the mss of Sri Krsna Lila Stava by Srila Sanatan Goswami after it had been missing for approximately 300 years. These maps were printed in Haridasa Dasa’s book Gaudiya Vaisnava Abhidhana in the 1940s. 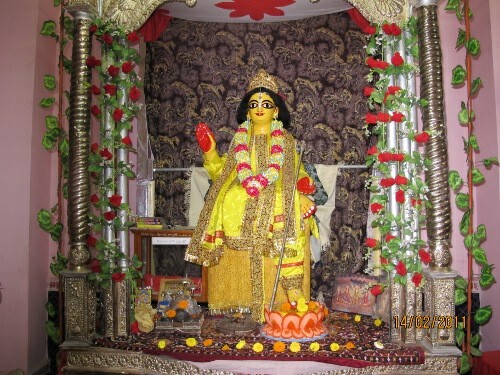 They depict the travels of Sri Caitanya Mahaprabhu around India, and also all the important holy places in Gaura mandala. Our researchers found them lying on a heap of garbage when they visited the matha. Now because of their intervention they are being kept carefully in the temple. We were allowed to photograph many mss. here also. Some places do value their heritage and here’s an example of some well kept manuscripts that we were allowed to photograph. Here’s Sri Uttam Sengupta, the librarian of Srikhanda Chittaranjan Pathagar, Bardhaman where the trust of Narahari Sarkar Thakura’s Sripata has donated these mss. Likewise in Yajigram, where the ISKCON administered Bhaktivedanta Swami Charity Trust has done renovation work we found some well preserved mss for our records. This is Sri Susanta Matt the Secretary of the Sahitya Parishad Santipur. He was happy to allow us to photograph many of their mss. 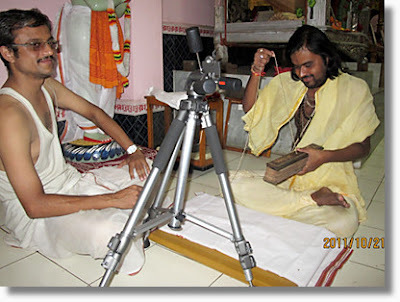 Of course not all the mss are of Gaudiya Vaisnava works, there are many on various other methods of worship, nyaya etc. and here we found some copies of various works by Sripad Sankaracarya. 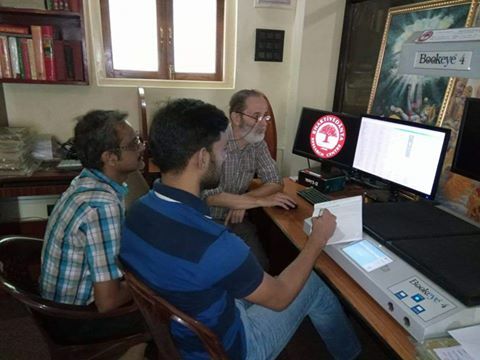 After this intensive work Bharati and Ashish, under careful guidance of our new head librarian Acyuta prabhu, spent the month of March at the BRC library in Kolkata building up a catalogue of the materials. 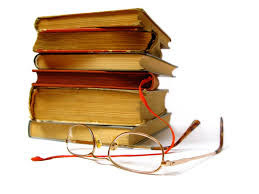 All the information gathered will be entered into our new website and library software in the coming months. Thus everything will be made available for researchers to take advantage of. The rapid loss of India’s great storehouse of wisdom, passed down for thousands of years via carefully copied manuscripts, is of great concern, both within India and abroad. In January 2011 at the Jaipur Literary Festival, noted Prof. Sheldon Pollock, a renowned scholar of Sanskrit and Indian literary history and general editor of Harvard’s Murty Classical Library, warned that in literary terms, India is on the verge of what he termed a potentially cataclysmic cultural ecocide. Of India’s ancient languages, it is only classic Sanskrit that is not endangered. Prof. Pollock’s concern is over the loss of the treasury of literature that already exists and has been preserved over thousands of years. The scholar, who teaches at Columbia University, says he has become gravely concerned over 40 years of coming and going from India. "Over the 35 or 40 years coming to India…it’s been the same in classical Assamese, it’s the same in Bangla, it’s the same in Gujarati, Marathi, Oriya and all the way down the long list," he said. 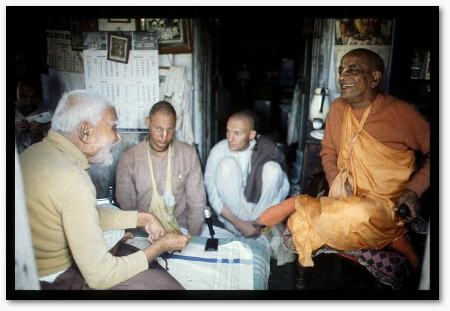 Srila Prabhupada expressed the same sentiments in 1972 when he instructed his disciples to go to Birnagar, the birthplace of Srila Bhaktivinoda Thakura, and photograph the original writings of the Thakura. I have asked Yadubara to come there to Birnagar from Bombay for photographing all of the manuscripts in the possession of Lalita Prashad Thakura page by page very completely before it is too late. The pages are in very decrepit condition, so best thing is to request Lalita Prashad if we may take care of them by treating them against insects and storing them in a tight, dry storage place where they may be preserved for future generations of Vaisnavas to see the actual handwriting and words of such great saintly persons. Treat this matter very seriously and thoroughly, and take all precautions to protect this wonderful boon of literatures forever. Yadubara may photograph every page, never mind Bengali or English or any other language, and later we shall see where to send the copies to different places. These statements have provided our inspiration to try our humble best to protect our Vaisnava heritage for future generations. We are very happy to announce the appointment of Sriman Acyuta dasa as our new head librarian. Acyuta prabhu has been involved from the BRC's inception but now he has made himself available for full time work. 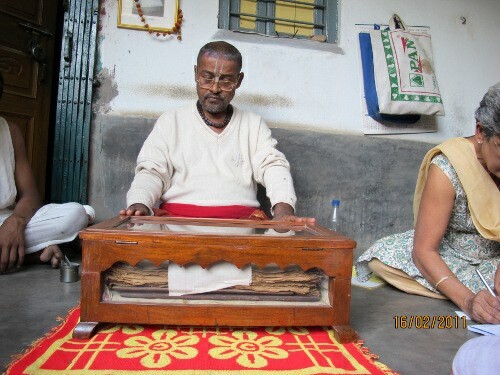 Acyuta brings with him 28 years of devotional service. 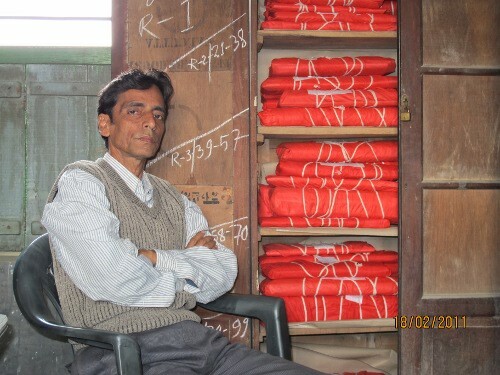 He has been engaged in research for almost 20 years in the major libraries and cultural/academic institutions of Kolkata. He has studied Library Science and all its connected subjects in two Indian universities (IGNOU and ICFAI), and has his own personal library of over 11,000 books. He has acquired expertise in the use of software and web resources connected with books & library science and his addition to the team is a very welcome plus. Beginning January 1, 2011 he will focus on setting up our computer system, professional library software and website. We have also hired a new assistant for the library, Ashish Chakroborty. Ashish is a B. Sc. and is engaged in scanning the many hundreds of books in our library at a current rate of about 400 pages per day. This is about the limit for the simple book scanner we have and our plan is to apply for a grant to upgrade to a professional semi-automated model that can do 700 pages per hour. 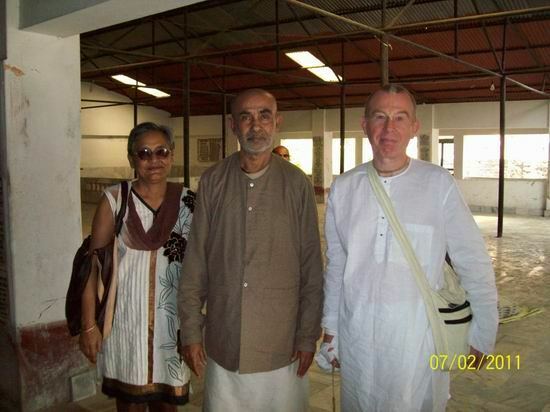 Bharati Roy began working with ISKCON scholars in the early 1980s, doing extensive research for the Institute for Vaisnava Studies (IVS) headed by Garuda dasa (Dr. Graham Schweig) in Bengal and Jaipur, and also translation work for various individual scholars. She has worked for the last year as the BRC librarian but field research is where her heart is. 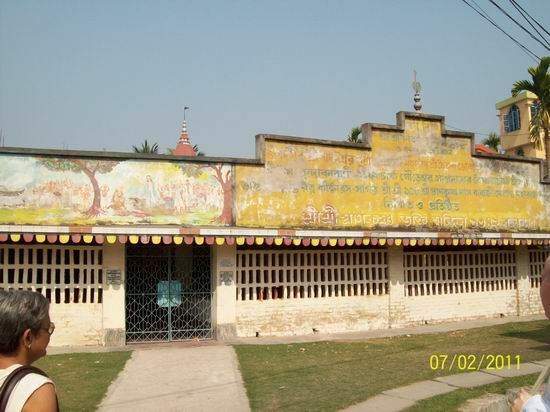 In the 1970s, as ISKCON was gaining a footing in India, Sri Tarun Kanti Ghosh, a Congress party minister, gave a lot of support to Srila Prabhupada and his disciples. Tarun Babu, as Prabhupada used to refer to him, came in a distinguished line of Gaudiya Vaisnavas. His grand father was Mahatma Sisir Kumar Ghosh a contemporary and friend of Srila Bhaktivinoda Thakura. The two knew each other well and co-edited certain publications and articles. The Ghosh family owned a prominent line of newspapers including Amrita Bazar Patrika which was established in 1868 and Jugantar, one of the biggest newspapers and presses in Calcutta. “Please accept my blessings. Since I attended the meeting last night I am feeling a new enthusiasm, over how potential the Krishna Consciousness movement is, based on the teaching of Sri Caitanya Mahaprabhu. Your good family has very great interest in Sri Caitanya Mahaprabhu, and especially your grandfather Mahatma Sisir Kumar Ghose was a great friend of Bhaktivinode Thakura. So we are coming down in disciplic succession from Bhaktivinode Thakura and you are coming in family succession from Mahatma Sisir Kumar Ghose, so if we combine together in preaching the message of Sri Caitanya Mahaprabhu, it will be a great benediction to human society for mitigation of all kinds of problems of material existence. Everyone of us is suffering from the three fold miseries of material existence. Coming to the platform of bhakti, pure devotional service, one immediately ceases the blazing fire of material existence. That is the effect of Sri Krishna Sankirtana. The whole world is in chaotic condition without understanding this philosophy. “So in the beginning if we start a varnasrama college to teach internationally students from all over the world to learn to be educated as brahmanas, as Ksatriyas, as vaisyas, as sudras, by quality and work, that will be the basic principle of Krishna Consciousness. It is the duty of the government to see that everyone is employed. This is only possible when varnasrama is established. At the present moment everyone is sudra. This is not very good for the human society. Everyone has a right to approach the Supreme Personality of Godhead but there must be a process for keeping the society in order. The intelligent class of men or the brahmanas, the martial class of men, the ksatriyas, the productive class of men, the vaisyas, and the working class of men, the sudras, all have the right to chant the Hare Krishna Mantra and by such devotional service everyone will be elevated to the transcendental platform. But there must be a division according to quality and work. At the present moment, so many so-called educated persons are unemployed because the division of work is neglected. If this division of society is maintained no one will be unemployed and there will be no unrest in society. It is a very scientific way of keeping peace in the world. “The brahmana class should be highly cultured in spiritual understanding; by their Vedic knowledge they will be able to educate the ksatriya and the vaisya in the value of life. It is the government’s duty that according the division of human society everyone should be engaged in responsible duties. On the whole, at the present moment, there is not guidance from the authorized intellectual class. Therefore everyone is in darkness. The Krishna Consciousness movement is supposed to create actual intellectuals to guide society. The process if very simple. “If you kindly consider on this point and the varnasrama college is started, I am sure the chaotic condition of human society will be completely settled up. You think over this matter and we shall talk more when we meet again. Or if you like to discuss seriously by correspondence with me I shall be very glad to reply to you point by point on the basis of sastra. Tarun Babu left this world in 1996, the year of Srila Prabhupada’s centennial. He had requested that his ashes be scattered on the roads of Mayapur so that the pilgrims would trample on them and bless him with their foot dust. 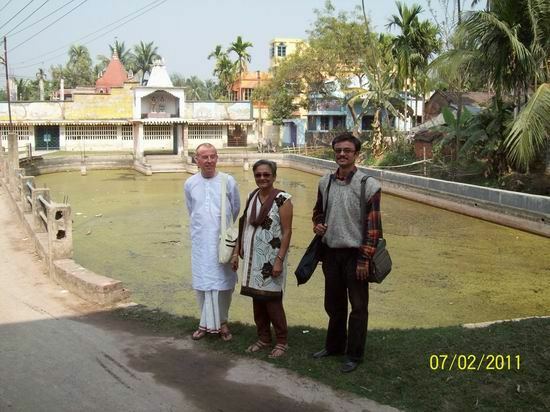 In the event, his ashes were brought to Mayapur and scattered in the Ganges with kirtana and due Vaisnava samskara. The family were very grateful to HH Jayapataka Swami and our ISKCON devotees for rendering this service.